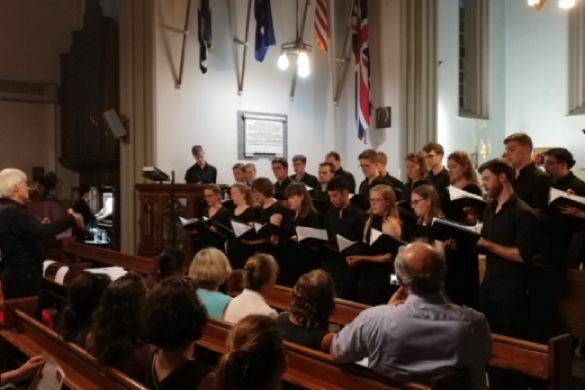 On Friday July 20th the choir of Queens’ College Cambridge University visited Athens and gave a concert at St. Paul’s Anglican Church. For all us who were lucky enough to be there it was a beautiful and uplifting evening. The choir of male and female voices was conducted by Ralph Allwood MBE. His introduction to each piece was always amusing and informative and heightened our anticipation. The programme included music from the 16th to the 20th Century. The composers ranged from Italian, Spanish, French, German, English and Australian to Irish. 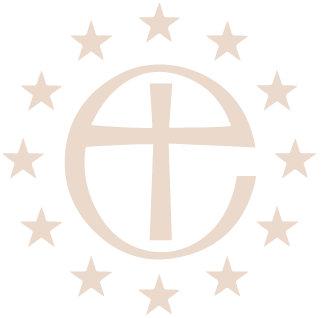 The concert began with four 16th Century Latin Chants. The type of music that can transport one to another plane. Perfect pitch and perfect harmony. As the choirmaster had said at the start, although such music is often sad, it is this very sadness that lifts our soul! One well known piece, that most of us knew, was “Song for Athene” by John Tavener. Even if not known by name, it was the song sung at Diana Princess of Wales’ funeral. Sad and beautiful it drew a “bravo” from the audience. A young PhD student played a piece of Bach on St. Paul’s lovely organ. And later, as a tribute to a Greek benefactor of the College, a piano piece by Brahms. I have noticed recently how choirs will spread around the audience when singing in a church. Singing in the aisles gives a new and different dimension to what we hear. At some point the choirmaster had said how exhilarating it was to sing in such a beautiful building and how glorious to be able to sing up into the lofty rafters. I was lucky enough to be sitting near a soprano when they sang two songs “in the round”. Her superb voice did indeed reach the rafters and brought tears to my eyes, as I am sure it did to others. Angelic. St. Paul’s has been lucky and blessed to have been visited by a number of exquisite choirs over the last few years. 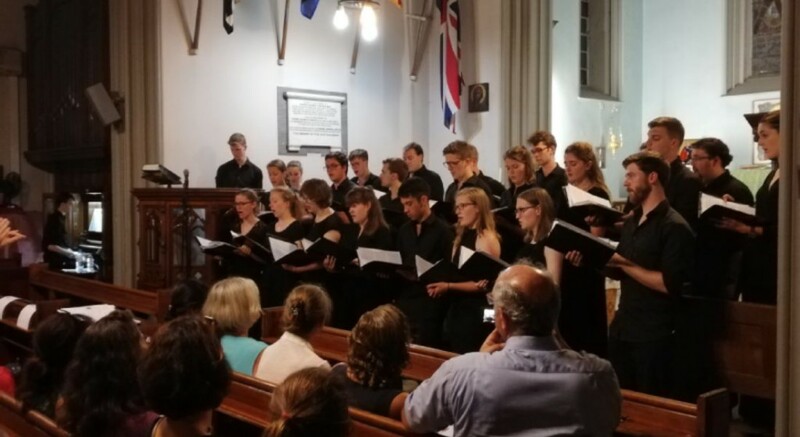 Whatever the age of the choir and some have been as young as school children, what is always so encouraging is their enthusiasm, dedication and perfect harmony with their choirmaster. If we can make the effort to go and listen, then they are rewarded by our presence and we are rewarded by an evening where, for a while, our daily cares slip away, our soul is rested and sometimes one beautiful piece or another brings us nearer to God. This concert was the last one that Jennifer Dovellou organized for St. Paul’s. 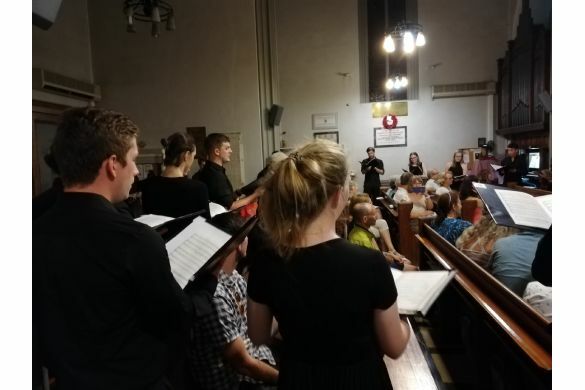 She has been overseeing musical events for some years and they have brought great enjoyment to the audience and a welcome financial boost to the church. It was a fitting finale. Thank you Jennifer. Another wonderful musical event at St. Paul’s, Athens. So many in recent years with a wide range of international artistes and genres, each with its own unique flavour. 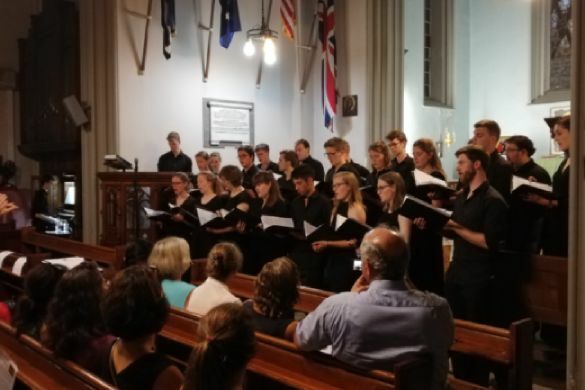 A huge thank you to Jennifer Dovellou for making our lovely church such a desirable venue for musicians and singers and planting us firmly in the Athens musical scene. And another thank you to Christina Antoniadou for picking up the reins and to those who help out in so many ways – upwards and onwards!